This is my second Lone Star quilt (the first one is here). 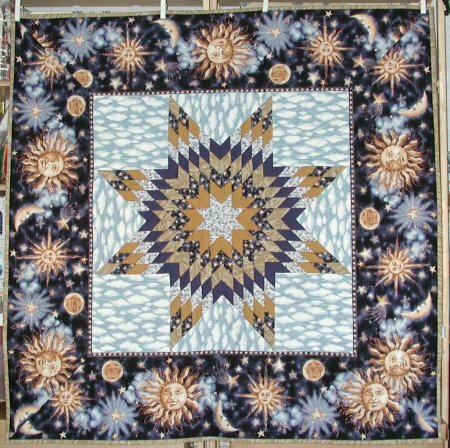 I was taking a class at my LQS around October 2000 and a fellow student, Rebekah, brought in a magazine (The Quilting Magazine, January 2001 issue), insisting that I look at it. I glanced at the cover and wasn't particularly impressed .. nice quilt, but not my cup of tea. Rebekah said that it wasn't the cover quilt but the Lone Star inside that I should see. And boy, was she right! It wasn't until about January 2001 that I actually called the store to put my name down for ordering the kit. It came as a shock to find out that, by the time the magazine was published, Northcott had *discontinued* the fabric line and the shop, though they bought all they could find, ended up with only a ridiculously small number of kits. 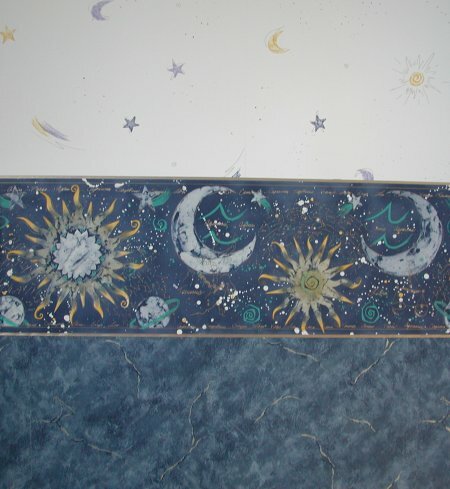 The key to this wall hanging was the use of the celestial border stripe around the perimeter. Without the border stripe, it really was "just another Lone Star". One of my mottos is (and just ask any of my girls for verification!) is that I do NOT like problems; I like solutions. You either go over, under, around or through the problem, but you *find* a solution. And generally speaking, it's a good philosophy (it certainly prevents the initial "I can't do it" complaint). So, with the specific fabric line information in hand, I went surfing through all my fabric links .. no luck. I tried lots of different search engines with lots of different search criteria. No luck. I was very disappointed. Next to not liking problems, I really can't stand *losing*, so I perservered. Then, at one of the quilts shows I attended, I was poking through the stash a vendor had brought. Much to my astonishment, they had, as a pre-cut 3 yard length, the BORDER STRIPE! OMG. Not remembering exactly how much of the border stripe was required for the wall hanging, I decided that discretion was the better part of valor ... or better to be safe than sorry .. I bought the entire 3 yard length. The vendor also had the companion overall star print, so I bought a bunch of that also. Armed with the focus fabric, I was then able to find other compatible, coordinating fabrics to construct the rest of the Lone Star. 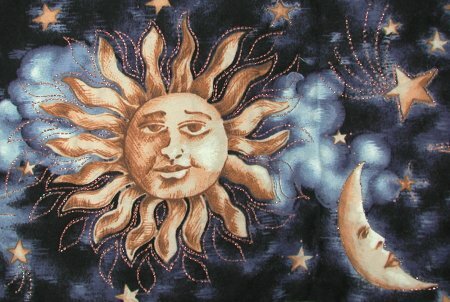 Some of the fabric was from Northcott/Monarch, but from a different line; some of the fabric was entirely different. Some was from online shops, some from my LQS and even *gasp* from a chain store! Yet, life is rather funny and has a way of forcing you to do things out of order. :-) Memorial Day weekend was coming up. I was talking with some of my online friends, who just happen to live in this general geographical area and we all agreed it would be simply splendid to gather at my house so that we could see the newly released movie, Pearl Harbor as a group, and have a BBQ dinner afterwards. 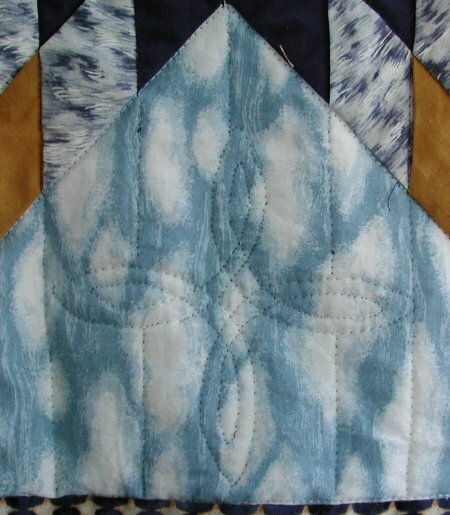 The quilting of the border stripe was done with Sulky Sliver (copper color), following the outlines of the celestial motifs. The quilting of the corner blocks & triangles was done in clear monofilament using a Celtic design I printed on paper and stitched through. I then filled in the background with parallel diagonal lines, following the lines of the Lone Star. The Lone Star itself was stitched in the ditch with clear monofilament. It wasn't until the entire wall hanging was finished and hanging on the wall that I noticed ... the fabric I had chosen for the background was DIRECTIONAL. ::thunking head on wall:: I hadn't realized that and so I didn't cut the setting triangles and corner squares with that in mind. 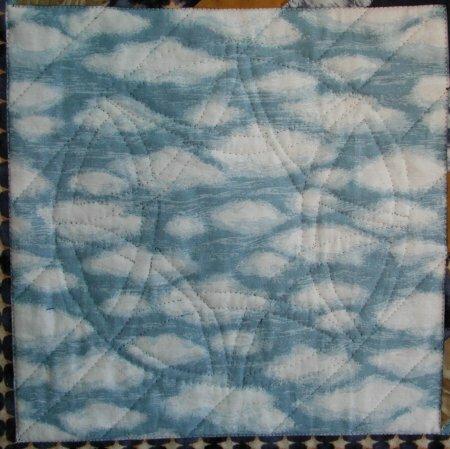 This mistake glares at me every time I look at the wall hanging, although I'm not entirely certain that non-quilters will pick up on it. It certainly grates on *my* nerves.